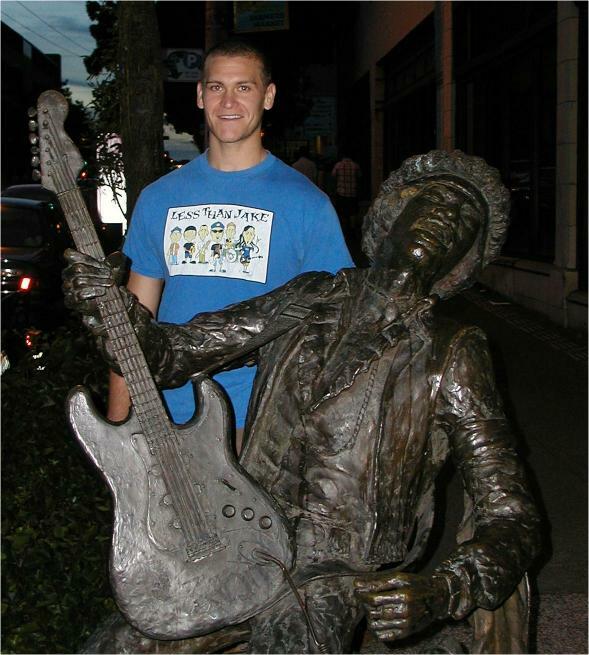 Dan's pretty fond of 60s music, especially of the more electric variety, so I took his picture at the statue of Jimi Hendrix on Capital Hill (here in Seattle, of course, not in DC). The statue is outside a studio where Jimi recorded. Dan's first admission was to Thomas Jefferson; Dean of Admissions Beth Kransberger was nice enough to call him with the news. It is #@$% COLD here. I walked out of the law school last month at 2:30 am and was so shocked at the temperature that I actually had to stop and comprehend a degree of cold I had never felt before. When I got home I found out it was -15 degrees. That type of cold is preposterous. In his second year Dan moved out of Carlisle and up to State College. Towards the end of the summer he decided to share an apartment. He wrote, "Mike D'Angelo goes home to NY from time to time to visit his ma and comes back with some of her homemade pasta sauce. It's incredible!" I just found out that I was selected as Managing Editor of the Penn State Environmental Law Review. As a result, I am going to a national law review conference in Miami over spring break. Miami is only about 1.5 hrs. from Naples, so my folks are going to come over and hang out for a bit. Should be fun... and warm! It certainly doesn't look as if the law journal kept Dan away from the weight room. He definitely enjoyed the switch to Penn State main campus. September 2009 Update: Dan passed the Florida Bar Exam, and is off to celebrate!